PRO: Re-signed with the Riders in December, 2017…signed with the Riders in September, 2017…signed with the Indianapolis Colts in August, 2017…signed with the Buffalo Bills in September, 2016…signed with the Oakland Raiders as an undrafted free agent in May, 2016. 2018: Started the first seven regular-season games at left tackle…spent the remainder of the season on the teams’ injured list. 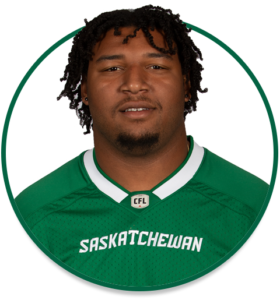 COLLEGE: Spent four seasons at Stephen F. Austin (2012-15)…played 46 career collegiate games, with 38 starts…primarily played right guard…honourable mention All-Southland Conference in 2014.